Poland: Training center to save a stadium scheme. How? Stalowa Wola is one of those cities in Poland that some people heard about, others mistake it for Chopin’s birthplace, but rather few actually visit. Perhaps the largest magnet drawing people here is football: hundreds of travelling supporters come regularly to visit the much outdated stadium and face local side Stal in 3rd league campaigns. Domestically Stal is known for having reached top tier football in 1990s and currently defeating higher-ranked Ekstraklasa rivals in the Polish Cup almost every season. On occasions the local stadium is filled to capacity or beyond, but regular games are attended by hundreds rather than thousands (so far 841 per game in 2015/16). Still, in 2008 the city announced its architectural competition to design a new 10,000-seat stadium, to be delivered in phases. Despite international bids, it was won by the only in-town contender, Arlex. While aesthetically appealing, the company’s design had its flaws and was revised early on. By 2011 construction of the first phase (east stand) had begun, ending in late 2012. With 1,430 seats and an impressive raised roof, it’s the best part of the stadium. Unfortunately, the city was unable to carry on spending significant amounts on the stadium without increasing its debt. When it was planned in 2008, there were external funds available from the EU and Polish sports ministry. By 2014, when another phase was to commence, both sources were closed. For this reason to this day there was no progress. Until last week, when the city announced new plans. Since the sports ministry now subsidizes training facilities rather than big stadium projects, the municipality revamped its scheme. It now includes only one grandstand (west) and four training fields to create the best training centre throughout Subcarpathia, one of Poland's most rural regions. Stalowa Wola is yet to submit its bid for governmental money, but already now the project has support of PZPN (Polish FA) and its regional body in Subcarpathia. If the ministry greenlights it, the central and local authorities would each spend PLN 20 million ($5.3m) over the next two years. What’s crucial is that the city would thus get its most important main grandstand (west, seen below), which it would not be able to deliver without external help. With almost 5,000 square meters of floor space and 2,000 seats, the stand could secure all domestic and most international requirements for years to come. Now all that’s left is to file the paperwork and await the ministry’s decision. It may not be a 10,000-capacity stadium any more, but 3,689 seats and the region’s top training complex sound like a decent plan! Especially that current attendances in no way suggest regular ticket demand of 2,000+. 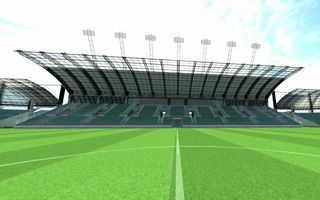 And if Stal manage to grow and reach Ekstraklasa in a few years, surely the stadium wouldn’t hold them back.